This fun recipe for summer gatherings is best when you prep the pork with enough time for the fruity marinade to soak in. Stir together preserves, liqueur and butter, simmer in a small saucepan until butter is melted. (OR combine ingredients in a 2-cup glass measure; microwave on High 1 minute). Place pork cubes in heavy plastic bag, pour 3/4 cup apricot mixture over to coat. Marinate at least 30 minutes. 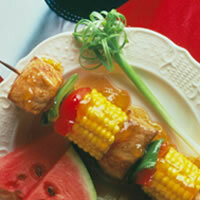 Thread pork onto 4-6 skewers, grill over hot coals 10-12 minutes, turning occasionally and basting with marinade. Heat remaining apricot sauce to boiling and serve alongside kabobs, if desired. Serving Suggestion: Fill out the kabobs with corn, colorful peppers, onions, and whatever kabob-friendly ingredients you desire.